Here’s what’s new in WP Optin wheel version 1.2.0, released on 6 November 2017. Optin webhook: a link which will listen to all ‘optin’ events. An optin event occurs when a user subscribes to your list through the plugin. Play webhook: a link which will listen to all ‘play’ events. These settings will allow you to connect just about any software to our plugin. You could easily use Zapier to facilitate the connection. In fact, we’ve written a tutorial on how to connect WP Optin Wheel with Google Docs, to maintain a detailed log of all wins and losses. One of the biggest issues with any opt-in plugin is battling fake email addresses. 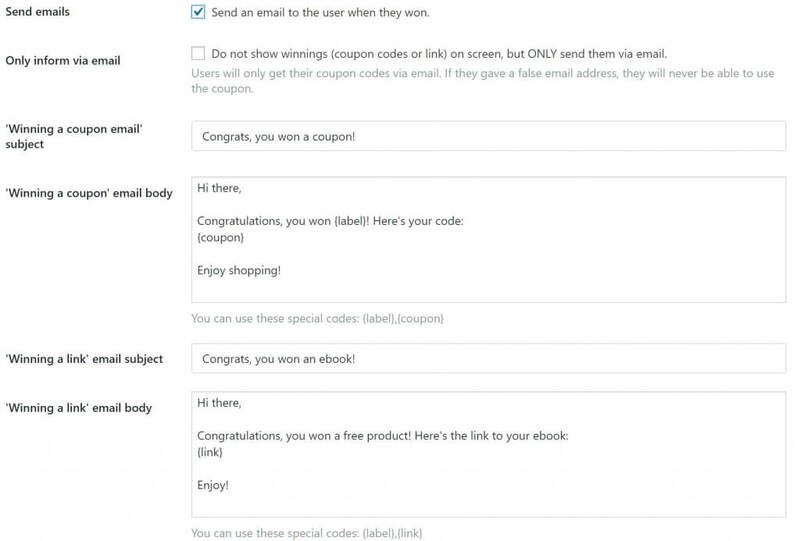 To help you out with that, we implemented the ability to send prizes (coupon codes) to your users via email, as opposed to showing them directly on the screen. Written by Maarten Belmans on November 7, 2017 in Release Notes.